I like these ten-second paper fortunes whipped up by Leyla Torres at Origami Spirit. Each little stick unfurls to reveal a message. You could make a jar of love notes for Valentine's Day, offer recipes to guests as party favors, or have your kids draw tiny pictures to mail to grandma. They're cute. Watch Leyla's instructional video right here. What a great idea! I will definitely give it a try. These are the best thing ever! I just watched the video and made a 'stick'. So quick and easy and effective. Love them. Thanks for a wonderful kids Valentine party idea. 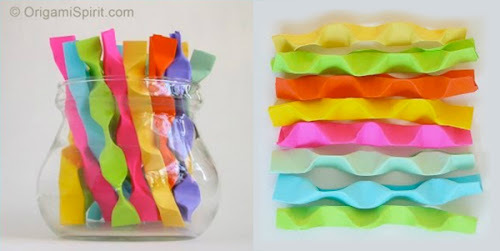 How fun, thinking of what I can make these for. Made these as a sort of 'advent calendar' for my husband who's going to Brazil for 3 week.....thanks for the idea! There so colourful and fun! Cute! Hi I've seen the video a few months ago, but completely forgot about it! Thanks for reminding me of this!